MAGNIFICENT OIL ON CANVAS " H.M.S Resolution".BY THE FABULOUS ARTIST DAVID ALDUS. .......................... ( Highest price received for one of his paintings is £10,000 ,absolute investment opportunity! ) This beautiful classic painting of the famous H.M.S Resolution .HMS Resolution was a sloop of the Royal Navy, and the ship in which Captain James Cook made his second and third voyages of exploration in the Pacific. She impressed him enough that he called her "the ship of my choice"In 1780, Resolution was converted into an armed transport and sailed for the East Indies in March 1781. She was captured by the Sphinx and Annibal of de Suffren's squadron on 9 June 1782. After the action at Negapatam on 6 July 1782, Resolution was sent to Manila for wood, biscuit and rigging, and to press any seaman she found there. 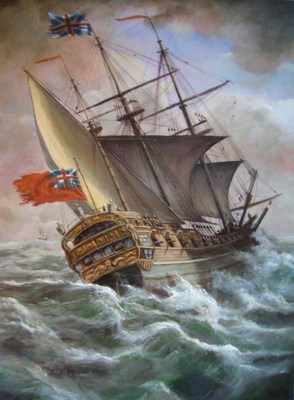 She sailed on 22 July 1782 and was never seen again........................... Measurements height 24 inches by 16 inches. Oil on canvas. .